Kheer-Bhawani: Emotional scenes were witnessed on Wednesday during Mela Kheer Bhawani here as it's that time of the year when Kashmiri Pandits (KPs) reunite with their Muslim brethren, who wait eagerly for the whole year to meet their long-lost friends. 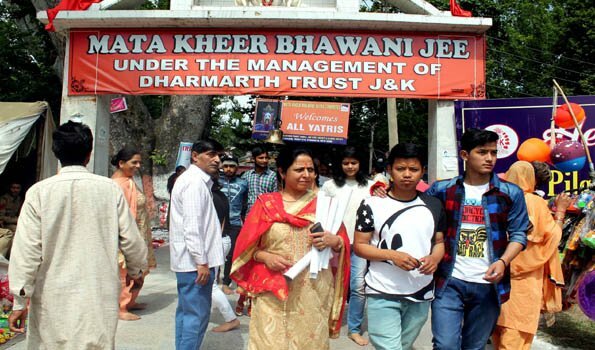 Every year in June, Tullamulla in central Kashmir district of Ganderbal is abuzz with Kashmiri Pandit families celebrating Mela Kheer Bhawani, their most important festival, associated with the Hindu Goddess, Ragnya Devi. Emotional scenes were witnessed when a local Muslim -- Ghulam Rasool Dar -- greeted his Pandit friend -- RK Raina, who was visiting the valley after a gap of about 25 years. "I'm visiting the valley after a gap of about 25 years. The last time I visited Kashmir was in 1993, but since then I have been yearning to return to my roots and meet my friends," said an emotional Raina, who lives with his family in Bangalore. "Dar and I used to study in the same school, used to play the same games and lived very near to each other in the apple township of Sopore. We lost touch for about 10 years, but by the grace of God were against united with the help of some other friends. Since then we have remained in touch by phone," he told UNI. But, he said meeting him for the first time after 25 years has aroused many feelings, which are hard to describe in words. Dar, who had especially come from Sopore in north Kashmir district of Baramulla to meet this childhood friend, said meeting Raina is like a dream come true. "I will not have any regret in my life if I die tomorrow. Meeting Raina is something I have desired fom years and finally we are together. We have a lot of catching up to do, so after the Mela I have made arrangements for Raina's family to stay with my family at Sopore," Dar said. A local resident of Tullamulla, Shafat Ahmad said they wait for the whole year for their Kashmiri Pandit brethren to return to the temple. "I as a child used to attend almost every Mela with his father. I am still emotionally attached to the mela and the people of the area wait for this day the entire year," Ahmad said. He said the locals have made available their residences and their Pandit brethren can stay in these houses free of cost. "We don't want any monetary benefit. We just want things to go back to as they were before Kashmiri Pandits left the valley. They are an important part of us. We are incomplete without them and they are not complete without us," he added. The mela has become a symbol of communal harmony as local Muslims make all the arrangements to welcome the devotees. They set up stalls and provide devotees items for rituals. Azee Mass, a local Kashmir woman, who sells fruit on a stall, said the Mela given an opportunity for friends separated to unite. "The mela doesn't only provide an opportunity for Muslims and Pandits to meet, but also acts as a bridge between Pandit families, who live in different parts of the country," she said. She said she goes to Jammu to meet her Pandit friends and the latter visits Kashmir to meet her.Another devotee Anil Razadan, who had availed the free bus service provided by the state government from New Delhi to Kashmir, said that come to the valley after a gap of 30 years was dream come true. When asked if he had any apprehensions about the situation in the valley, Razadan said, "I was sure that the people of Kashmir can never separate us from their hearts and at the same time was sure that the administration will not let us down." He said the journey from Delhi to Kashmir was comfortable and adequate arrangements were put in places. "We had refreshment at Udhampur early in the morning and then reached the temple safely. People along the way waved at us affectionately," he added. Similar views were expressed by youngsters who are visiting the valley for the first time. "What we were hearing from our elders about Kashmir and its people was true," they said, adding 'we feel proud that we have roots here where people still love each other irrespective of their religion'. "Whatever has happened has happened and no one can change that. But, it is the responsibility of the government and people at large, including both Muslims and Pandits, to work together for a better future of Kashmiris, irrespective of their cast, colour and religion," said Ankit Tickoo, whose family lived in Habakadal in downtown Srinagar, before migrating to Pune. A minority status to Hindus in Kashmir!